Nestled in native bush overlooking Lake Wakatipu, Matakauri Lodge, is one of the world's most private and serene vacation retreats, only a short distance to Queenstown, the alpine wonderland of New Zealand. The Lodge and its adjoining villas are luxuriously appointed and have been designed to be in harmony with the lakefront environment and surrounding bush. Matakauri Lodge is unique ... the first luxury lodge to open in the new Millennium in arguably the world's finest destination resort, Queenstown. It is one of New Zealand's most private and serene vacation retreats, nestled among bush on the edge of Lake Wakatipu, just ten minutes drive from Queenstown. Matakauri lodge is set in ten acres of native bush, partially landscaped with rolling lawns, a meandering stream and surrounded by a pine forest which creates an atmosphere of supreme privacy and enjoyment. 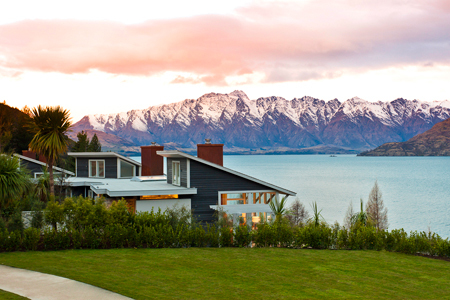 Guests from around the world visit Matakauri Lodge for its distinctly beautiful and dramatic vistas of Lake Wakatipu. The pure waters of Lake Wakatipu are fed by pristine rivers and quiet streams while sheltered bays and coves line the 140 kilometres of shoreline. Amid towering mountain peaks and edged by native New Zealand bush and high country pasture, the lake environs provide a natural haven for an abundance of trout, bird and wildlife. Private walkways from the Lodge lead directly to the lake shore and provide easy access to a scenic walking track. Moments of peace and tranquility may be found in a stroll along the lake, reading an engrossing book in the library, or simply listening to the sounds of waves lapping the shore, enhanced by birdsong and the gentle whisper of a breeze rustling through the leaves. Fresh clean mountain air and breathtaking beauty complete this ideal recipe for total relaxation and renewal. Guests enjoy a variety of facilities including the Spa Pavilion with sauna, outdoor hot tub and exercise room. Relax at Matakauri is an exclusive program of tailor made yoga and massage sessions all enjoyed in the comfort of your own villa or suite. Appreciating the pleasures of life and healthy rejuvenation are at the very core of what makes Matakauri Lodge such a unique vacation retreat. Guests can enjoy the Spa Pavilion with sauna, outdoor hot tub, massage and exercise gym room. The peace and quiet of the Matakauri Lodge surrounds may encourage you to take advantage of the fully equipped gym. An Elliptical and Rower is available with a full variety of weights. The local walks are also a popular addition to the Gym activities. The library is within easy reach of all thevillas and suites and not only is it well stocked with a vast collection of interesting books and magazines but there is also a splendid video and CD collection. You can even catch up on a game of chess. Perfecting the fine art of the dining experience, the staff at Matakauri Lodge will arrange an elegant setting to suit your mood, be it outside under a majestic sunset accentuated by breathtaking views, caressed by the dining room fireplace, secluded downstairs in the cosy and intimate wine cellar or in the privacy and relaxation of your own suite - the choice is yours. Exquisitely prepared meals feature a wonderful selection of fresh seasonal products. An equally splendid selection of award winning local wines compliment the meals. Sumptuous desserts and hearty breakfasts are also trademark house specialties. Each Villa and Suite has its own private garden terrace that looks out to mountain and lake views and each is complete with every modern convenience, including satellite television with teletext, double phone lines, CD player, hair dryer, pure wool blankets, bar, fridge, and tea and coffee making facilities. The three Suites are within the main Lodge building. All suites include underfloor heating and reverse cycle air conditioning to ensure total comfort for all seasons. King-size twin set beds are furnished with the finest quality linen and feather and down pillows. Private outdoor terraces offer panoramic views of the lake and mountains. The Walter Peak Suite is a ground floor suite with an east and west courtyard which catches the first and the last of the day’s sun. 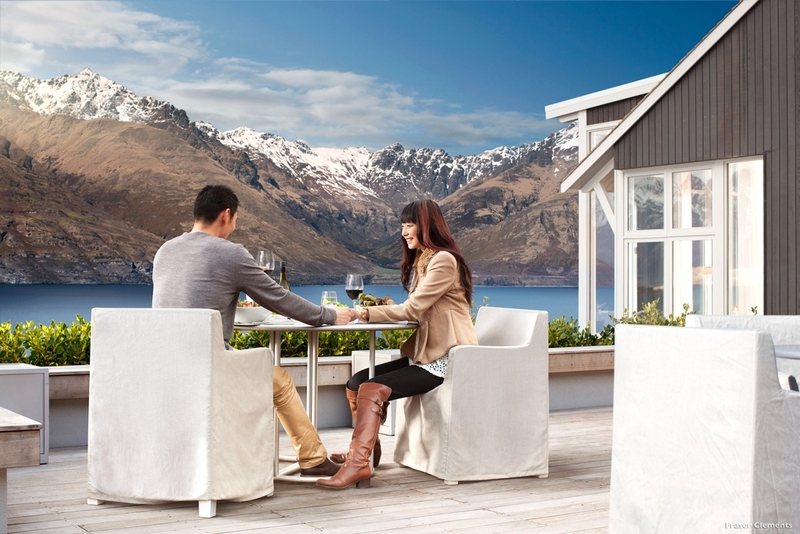 It has a separate lounge with extensive views of Cecil and Walter Peak. This suite is also designed to cater for a special need guest, so they have omitted the bath tub and added an extra large shower. The Matakauri Suite is a two bedroom, two bathroom, loft style suite includes an additional separate toilet, a terrace, a balcony and an extra large lounge with uninterrupted views from the Remarkables Mountain Range to Walter Peak. The main bedroom is on a split level with ensuite which includes double shower twin vanities and a two person spa bath. The second bed room is a smaller, loft style bedroom which has an ensuite, but no separate lounge area. The Wakatipu Suite is an upstairs suite which features a separate lounge, ceiling-high picture windows with views from Cecil to Walter Peak. The spacious private terrace opens on to landscaped native bush gardens. The large bedroom overlooks the terrace and the separate bathroom has a shower and deep two person bath. 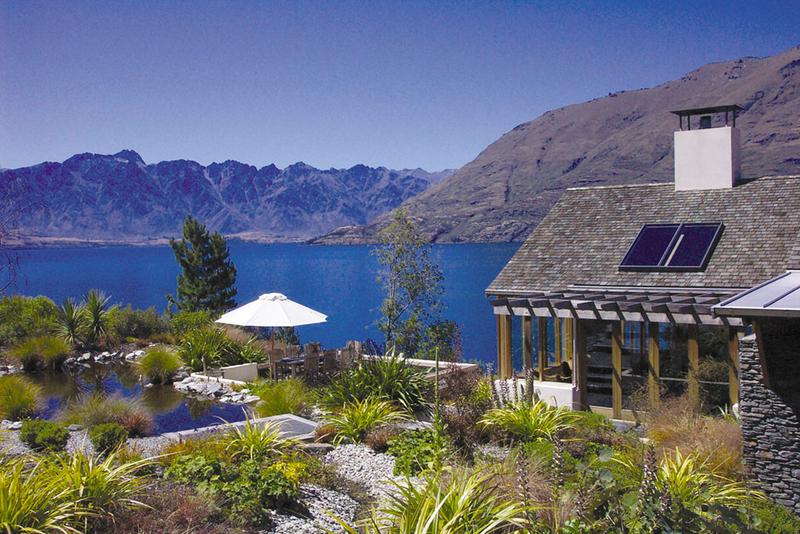 The Villas - Remarkables, Manata, Matau and Cecil Peak - A short walk through native bush from the main Lodge, the 700 square foot Villas offer the ultimate in space and privacy. A separate lounge with open log fire, large window seat and private outdoor terrace enjoy 180 degree panoramic views of the lake and mountains. Also taking in the panoramic views are the extra large bathrooms featuring twin vanities, double showers, heated towel rails and extra large spa baths. King-size twin set beds are furnished with the finest quality linen and feather and down pillows. Underfloor heating and reverse cycle air conditioning ensure total comfort for all seasons. Matakauri Lodge is an ideal base to tour this part of New Zealand. Milford Sound, Fiordland National Park, Central Otago Wine Tour, Eco Tours to Otago Peninsula, Lord of the Rings Tours, Guided Nature Walks, Horse Riding, 4WD Safaris, Fly-fishing and Lake fishing, and exclusive private guided tours are all possibilities.